If you hadn’t figured it out from my blog name, I love burlap. It’s versatile yet inexpensive, simple yet classic, and can fit in with any decor style, from modern to farmhouse, shabby chic to contemporary. Recently, I’ve been smitten with the contrast of rugged burlap and sweet ruffles. And so, with an ottoman gifted to me from my mother-in-law, I went to work! Disclaimer: I am not a seamstress, I am not an expert at the sewing machine, and I am sure there are (much) better ways to complete each step…I am just showing you what worked me for (and it definitely worked!) If you know of a better faster, easier way, please share in comments! 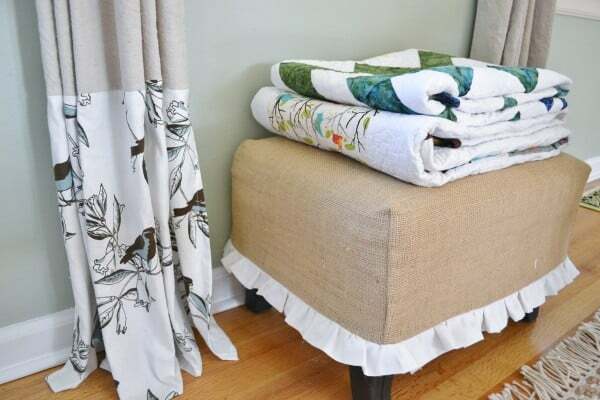 Step 1: If needed, cover ottoman with any plain, neutral-colored cotton fabric. You can see the original red, green and yellow fabric underneath my fabric, but it doesn’t show when covered with the burlap. The original goal was to use a staple gun, but the staples didn’t go through the frame of the ottoman like I needed them to, so I switched to my trusty hot glue gun. As you can see below, I was very precise, careful, and meticulous (not). In actuality I just cut off the bulk of the excess fabric, folded the fabric over and glued. The best part is that it doesn’t matter and no one will know. Step 2: : Lay burlap over ottoman, cut off excess. If the burlap had a right side and a wrong side, I would instruct you to lay it wrong side down., but it doesn’t matter in this case. The ruffle will add about an inch and a half or so to the burlap. I basically covered the ottoman with the burlap to just about reach the legs. I figured the extra length I’d gain with the ruffle would make the length about right. Step 3: Pinch excess fabric at corner of ottoman and pin. This is the line you will be sewing. Repeat for all four corners. You do not want to pull too tightly, or you may have difficulty getting the slipcover on and off. I also did not want my slipcover too baggy. I just pulled the excess fabric gently and pinned. Step 4: Make your ruffle! Fabric will be folded over in half to make ruffle, so I cut strips of fabric about 4 inches wide. This will make a ruffle approximately 2 inches wide. After allowing a bit for seam allowances, your ruffle will hang down approximately 1.5 inches on finished slipcover. Begin by cutting long strips of fabric. I think the rule of thumb is to cut a piece of fabric that is double the length of what you will need. For example, if you need a ruffle that is 80″ long, you will need a length of fabric that is 160″ long. So cut your strips of fabric, fold over and iron to make a nice crease (or not, if you prefer). And you should know I did this in three separate sections. It is very frustrating to break a thread while gathering fabric, and the longer your piece of fabric that you want to gather, the more likely this is to occur. Then, once you have your lengths of fabric creased and ready to go, go to your sewing machine, lengthen your machine stitch to the longest setting, and sew a line down the length of your fabric, about 1/4 inch from the end. I set my machine to 6 stitches per inch. Again, not sure if that is at all the correct way to do it, but it worked for me. You do not want to backstitch on either end!! Make sure to leave long threads on each end…see following two pictures. This is important as you do not want to start pulling threads on one end and end up pulling them through the ruffle at the other end (I hope that makes sense). This is my fabric before I started gathering…the machine did most of the work for me. Once you have sewn down the length of your fabric on all three pieces (or however many you decide to do), start at one end and gently pull the threads and slide the fabric down the threads as you are pulling. This will cause the fabric to ruffle. I stop when I have about half the fabric ruffled, tie off the two threads, and repeat for the other end. Play with it until the ruffles are as tight or loose as you want them! Step 5: Sew lengths of fabric together (right sides together) and press seams open to connect fabric lengths to make one long ruffle strip. And yes, there will be exposed seams on the backside of the ruffle, but, again, it is the backside and no one will notice! Now the next step should be to sew a regular stitch along the gathered edge to hold the ruffle in place. I skipped this step, as I knew I would be sewing the ruffle to the burlap shortly. You may not want to skip this step if you think the ottoman will get heavy use or you plan on washing the slipcover often. Step 6: Pin ruffle along burlap slipcover right sides together. Using a regular stitch, stitch all the way around slipcover. Step 7: Turn slipcover inside out, place over ottoman, and be proud of the fact that you spent about $5 (less if you have burlap lying around) for something that looks like it cost so much more! Well done…love the ruffle on the bottom. and I like that it is not permanent and can be changed easily…I'll remember this!! I love the new look of your ottoman. I might have to try that! Cute blog, BTW. Too cute! I may give this a try myself:) thanks for the inspiration. Love the cover, the ruffle is the perfect finishing touch. Thanks for visiting today, please come again. Your ottoman is so adorable! I just love the sweet little ruffle! Thanks so much for visiting,and for your nice comments! I think it looks wonderful. Great job! I share your love of burlap, gal! Your ottoman is just lovely! You did a great job! My ottoman is very large and opens to reveal all of our board games, so won't be making one of these! At least not yet! What a cute project! Your directions are great. Now I just wish I had an ottoman to cover. That is so cute! I love how it looks and I think your directions are pretty clear. Stopping by from Metamorphosis Monday–where I submitted a link to my latest burlap project! Oh, how cute your project turned out! Love the combo of burlap and sweet ruffles! 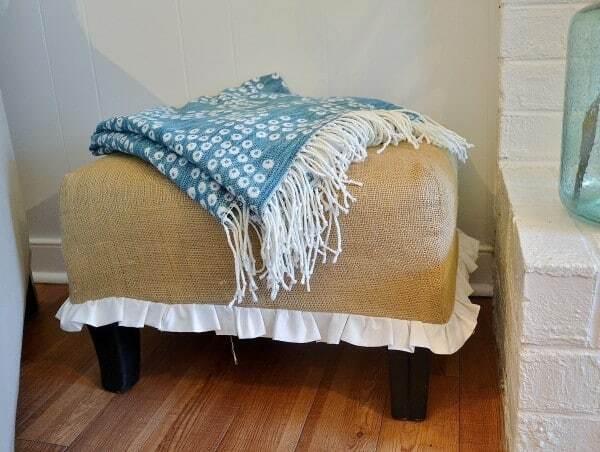 I've been making lots of pillows using muslin and burlap, now I think I need to do one of these ottomans. You are so clever. The ottomon is wonderful! Love the burlap and the ruffles. ahhh…it's divine! i love burlap too and that ruffle is sooo sweet! Stopping by from Metamorphosis Monday! How cool is that! Love the ruffles with the burlap! That turned out so cute, and cottage like. I have to say THANK YOU…I purchased two wing back chairs with ottoman and I wanted to use burlap. I just really didn't know how to go about it. Now I just need to figure out the chairs. SO cute!! I love burlap. I never thought of putting it on an ottoman but I love it! 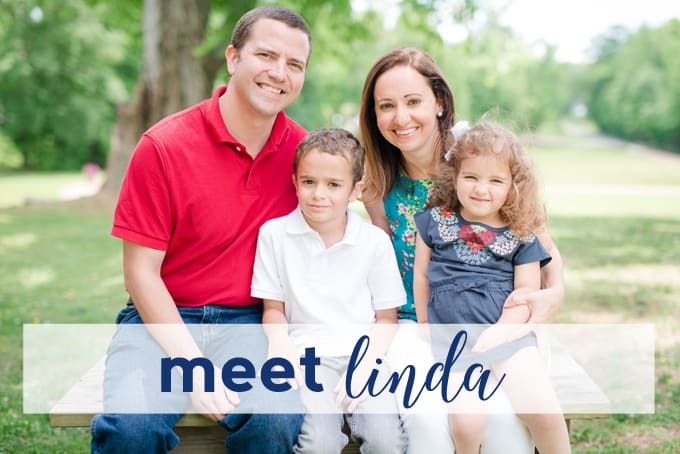 I'm just finding your blog….love your style! I have an absolute OBSESSION with Burlap! I’ll be doing thos tomorrow.